OK, a preliminary schedule is in place that will map the day, each day, every day. in the post reality, there is no time to waste, every second counts! Right now, I am working within the allotted time to write in this journal, which means, I am not rifling through Facebook, I am not working out some software issue, I am not trying to rewire my studio, I am not out for a walk, I am right here 100% writing in this online journal, although it could just as easily be the written journal right in front of me on my desk. 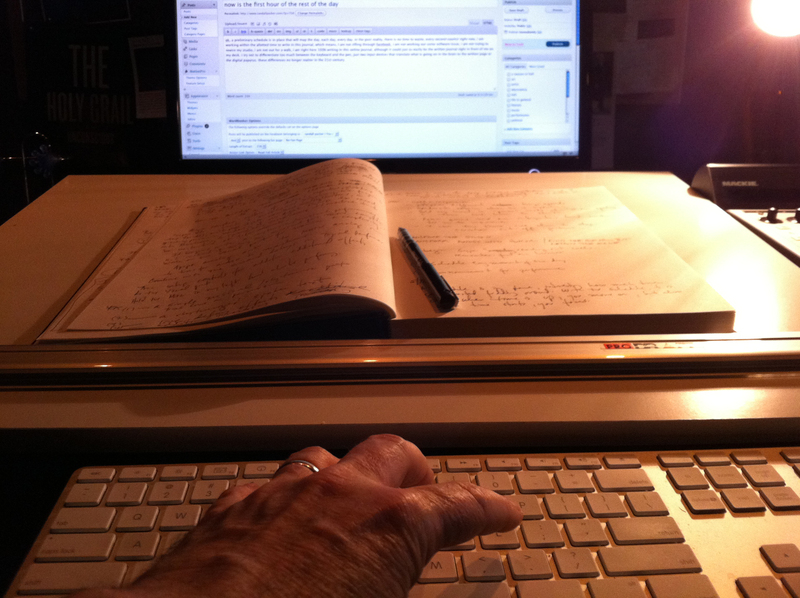 I try not to differentiate too much between the keyboard and the pen, just two input devices that translate what is going on in the brain to the written page or the digital papyrus. These differences no longer matter in the 21st century.